Apple revealed an all new “next generation” MacBook Pro at WWDC 2012 today, it’s the first retina Mac to be made available and comes in addition to their standard MacBook Pro line. The enclosure looks similar to existing unibody MacBook Pro models, though it is significantly thinner and lighter than any previous models. Shipping begins today, 6/11. We will update with more information as it becomes available from Apple. firewire is old tech + you can get a plugin cable. Store is down, but… shut up and take my money! The old style MBP 15″ got a processor and graphics bump refresh as well, and still has ethernet and a non-SSD hard drive. Unfortunately it doesn’t have Retina display. Looks like if we want retina, we need to go with a Steroid MacBook Air. I’m disappointed they went this route. Cables on both sides is okay. The 2 USB ports next to each other was poor design because if you were using a thick internet modem/dongle with no USB extension cord, the neighboring port was rendered useless! Where is the Line-in on Retina Macbook Pro???? So i’m going to have to buy a usb sound card to plugin my guitar etc? What about for DJ’s? Audio producers???? Do they expect all that power for browsing Facebook and making Facetime calls? The Pro series is for that kind of use. Facebook and facetime can be done on a Macbook Air. but what serious producer or dj would use the built in audio interface anyway? i use an external audio interface like every other producer i know.. True, i guess for “Pro” audio producers. But is their a simple way for my to directly plug in my guitar for fooling around in garage band etc? Or will i have to purchase a separate sound card? Kinda seems like a waste for a simple audio in feature to be missing. 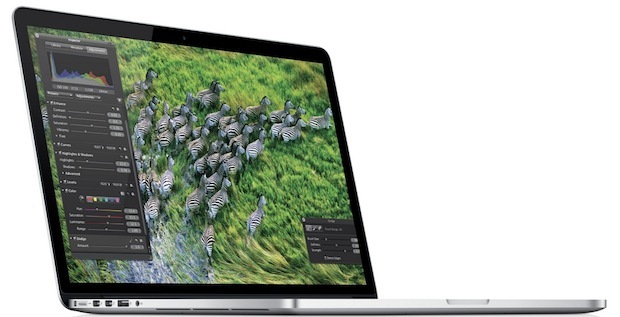 What about MacBook Pro 17″? No upgrades on that? What people should know is there is no tech gadget that will ever meet all your needs! Apple have pushed boundaries with the new mac pro…something that all other pc manufacturers have failed/are failing at. With that said, I think mac pro retina display is good to go!! if the new one has hdmi, does it mean you can connect your ps3 and xbox to it?? Can someone PLEASE answer this?! Yes / No / Wait for it. No, it is HDMI out. Although with a converter you used to be able to connect HDMI into the mini dvi port on MacBooks and with some fiddling use the display as a PS3/Xbox display. The dvi ports were a bit more clever than plain HDMI though. My desk isn’t 4′ narrow, and my wife isn’t 5’1″ short…and neither is this product 0.71″ thin. When sites adopt changes in terminology introduced by marketers, it makes a bad impression.